HOME SHOWS MEDIA BLOG FAQ BOOK NOW! Amazing magic with everyday objects such as cards, coins, finger rings, strings, and dollar bills will leave your guests talking for weeks after your event! Kyle will create a fun and entertaining atmosphere for your guests whether it’s standing or performing tableside! It can even be booked in conjunction with Kyle’s stage act if you’re booking an after dinner show! What better way to warm your audience up with some “in your face” magic before the evening’s festivities?! Kyle’s stand-up act is perfect for the after-dinner show, community festival, or any other event where a stage is present! Laced with tons of audience participation, side-splitting humor, and a contagious dose of comedic energy that only Kyle can deliver, the stand-up/stage show will leave your guests howling for more! Whether it’s 50 or 5000, Kyle’s stage show can adapt to any audience size. You can be sure that every one of your guests will feel “part of the show” as each show delivers a unique brand of audience participation and comedy! What is “Mentalism”? Mentalism can best be described as a performing art in which its practitioner appears to demonstrate highly developed mental or intuitive abilities. 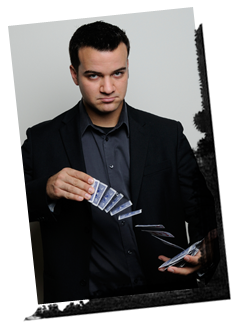 Witness incredible feats of mentalism as Kyle utilizes the power of the mind to dive into the thoughts of his audience and deliver a show packed full of unexplained phenomenon. 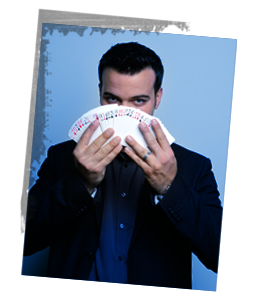 Whether it’s predicting the contents of an audience member’s sealed envelope, naming different objects while completely blindfolded, or reading the mind of a complete stranger, the Mentalism show will be sure to deliver an evening of extraordinary entertainment unlike any other you’ve ever experienced! 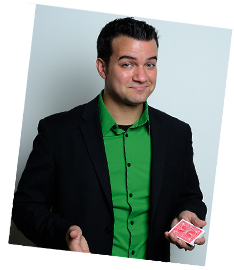 Drive traffic to your next trade show booth by having Kyle deliver a customized magic show that is specifically tailored to educate prospective clients about your company's products and services and maximize the return on your trade show investment. Specializing in "branded entertainment", Kyle will create a customized show that educates delegates and exhibitors about your company and generate qualified leads for your booth! Before all is said and done, people will swear that Kyle is an actual employee of your company that "just happens" to perform magic! Planning a special event for your little one? Check out Kyle Ryan's alter ego, Kyle Kazoo! Chock full of high-energy hijinks, visual slapstick comedy, and interactive games, "The Kyle Kazoo Show" delivers a performance unlike any other and makes your child the star of the show! Don't let the orange hat fool you, though, The Kyle Kazoo show is equal parts entertaining and impressive for both kids and kids at heart , so you can be rest assured that ALL of your guests will enjoy the show and make for an incredibly successful event! 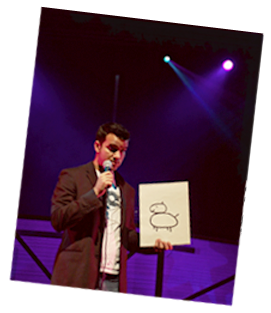 All of Kyle’s shows are family-friendly and appropriate for all ages. Each show is custom tailored to the occasion and will bring unprecedented excitement to your special event! At the end of the day, Kyle will just be the magician, but you will be the star of the show for hiring him!